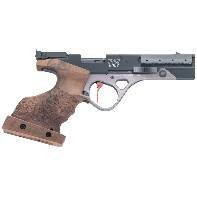 The FAS 6007 .22lr semiautomatic target pistol was developed in collaboration with professional shooters to significantly contribute to accuracy and handling during competitions. To optimize ergonomics, this pistol has many adjustable parts which can be precisely fit to the shooter for maximum balance, stability and control. The magazine is centrally located and inserted into the grip. Thanks to this magazine configuration the FAS 6007 has superior handling characteristics and the longest barrel possible for excellent accuracy and velocity.